Not a huge shock, but Democrats have recently been trying to attack Governor Kasich on a number of fronts. 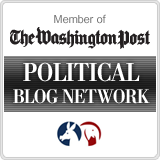 First they claim that Mitt Romney is trying to distance himself from Kasich. The proof? Governor Kasich didn’t attend Romney’s event in Ohio this past Sunday, on Father’s Day. This barely even warrants a response, because how dare a father choose to spend time with his family on Fathers Day. I know it’s crazy, but maybe the Governor wanted to spend time with his daughters privately instead of taking them to a full day of campaign events. Romney gave this quote to the Dispatch last weekend which shows a new narrative coming from his campaign. They realized that highlighting Kasich’s ability to outpace the nation is a good way to highlight the President’s failures. Governor Kasich's success is due to pro-growth policies that actually encourages entrepeneaurs instead Obama’s anti-business agenda. The Governor’s office released a graph that details the pro-growth policies that encourage business to grow and hire more employees. 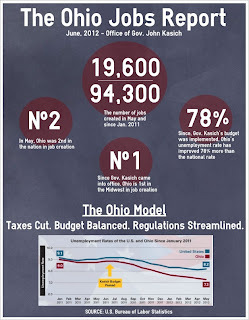 The Ohio Model of doing business includes taxes being cut, a balanced budget and streamlined regulations. Democrats are also trying to take credit for Kasich’s success in Ohio. They’re doing this to prop up the President, Sherrod Brown and especially Ted Strickland. If you follow politics in Ohio it should be pretty clear that Ted Strickland is going to run for Governor again. The problem is that he’s facing is explaining the 400,000 jobs lost under his watch and counter the success that Governor Kasich has had since he took over. 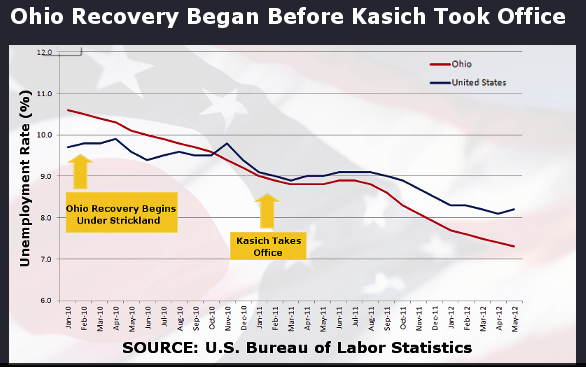 The idea the ODP came up with, and will continue to push, is that Ohio’s economy was on its way to recovery when Ted was in office. In all fairness, I’d try that argument too because how else do you explain the loss of 400,000 jobs while your guy was in charge? Does anyone see a problem with this graph? 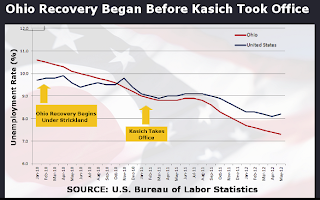 It shows what we have been saying all along; it wasn't until Kasich came into office that Ohio began outperforming the sputtering national economy. Furthermore, their graph shows that Ohio was actually doing far worse than the rest of the nation under Ted Strickland’s leadership. The ODP, who is supposed to be allied with Ted Strickland, actually reinforces the narrative that John Kasich has turned Ohio around. So I guess we should all be thanking the ODP for pointing out the facts?? Whoever put that together at the ODP should be fired.